Retirement: a Priority for Millennials? Saving for retirement is more crucial for Millennials than for any prior generation. Data are emerging that reveal how they’re doing. 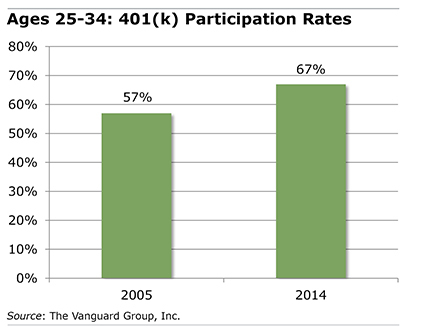 Vanguard’s 2014 data from its large 401(k) client base shows that 67 percent of young adults between 25 and 34 who are covered by an employer plan are saving – this is well above a decade ago. This indicates that Millennials are getting the message, said Catherine Collinson, president of the Transamerica Center for Retirement Studies.